If you want to promote your business or organization in a place where there’s a lot of foot traffic – tradeshows, airports and shopping malls, for example – then you might want to consider a banner stand to help you effectively reach your target audience. Seaboard Graphics can help you create just the right banner to help promote your business. 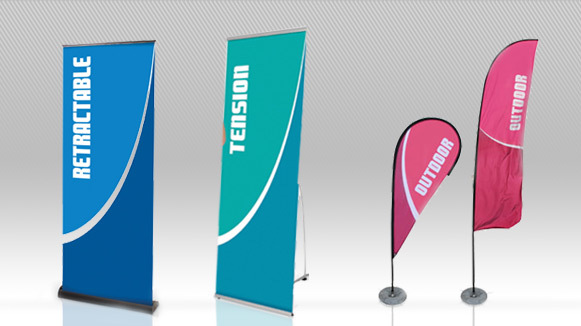 Banner stands, including retractable banners, scrolling banners and pop up displays, add visual impact to your display booth or exhibit at trade show. Designed to be portable and easy to setup, most of our banner stands are lightweight and can also be assembled by just one person under 10 minutes. But, banner displays, banner stands, and other graphic displays aren’t just for trade shows. Seaboard Graphics’ outdoor banner stands are perfect for shops, restaurants, businesses, lobbies and sporting events. Protected from the elements, these sturdy banner stands can withstand mildly inclement weather. To find out how Seaboard Graphics can help create banner stands and pull-ups for your business or organization, call us at 800-721-1663 or fill out this convenient online form.